SlamBall is a close relative to the game of basketball and is one of the world’s most exciting and dynamic sports. SlamBall was invented by Mason Gordon, a basketball and gaming fan who wanted to create a real-life game that mirrored what could be done in video games and as a game, it is best described as a mash-up of basketball and acrobatics and is played as a full contact sport. Played on a court that has four trampolines in front of each net, Gordon was assisted in creating the game by Smallville and Coach Carter TV producer Mike Tollin. They created their first court in an LA warehouse from which they tried to convince various street basketball players to try out their new concept. 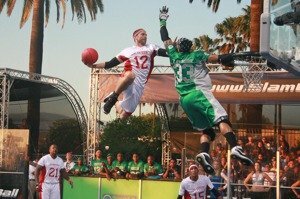 Two teams were formed and gradually the game gained traction within the basketball and street basketball communities resulting in SlamBall making its television debut on the US national network Spike in 2002. Since then, it has had a number of televised events and as a sport it is growing in popularity. You can find the latest SlamBall news on the official SlamBall website. The object of SlamBall is for one team to score more points than their opponent, whilst at the same time preventing the opposition from scoring points. Because it is such a dynamic and athletic sport with an acrobatic element, teams also unofficially compete to score the most spectacular slam dunks, performing a dazzling array of tricks and tactics. As a full contact game that's played at a frantic pace, for teams and individual players to be successful, players are extremely physically fit as well as displaying excellent teamwork and communication skills. Stopper: This is the defensive player in the team and is primarily there to stop the opposition from scoring. The Stopper will rarely be seen in offense because of the rapid nature of the game, an attacking team my need to defend their own net within a mere second or two. Handler: A Handler is effectively the midfield player and is the main ball handler of the team, moving the ball from defense to attack and organising attacking opportunities. Handlers will also help out in defense too. Gunner: The Gunner is the out and out attacking player in the team and is solely tasked with scoring baskets and not with defensive duties. Teams are free to use their players in any combination of these positions such as one gunner, two handlers and one stopper or two stoppers, one handler and one gunner. In terms of equipment, there is no special equipment required apart from a basketball, although league players are required to wear their team’s uniform and suitable footwear and many choose to wear knee and elbow pads as well as a specially designed helmet. Because of the trampolines required in SlamBall, a special court is required. This consists of a sprung floor with four trampolines set into the floor at each end. The size of the court is required to be the same size as a regulation basketball court and has to be surrounded by Plexiglass walls like an ice hockey rink. Three points: Slam dunks and all shorts outside of the three point arc. The winner of the game is the team that has scored the most points at the end of the match. If both teams finish the game on the same number of points, then a series of face-offs are played with the team scoring the most amount of points in these being declared the winner. Face-offs are effectively a one-one-one with one player defending the basket and one attempting to score. One attack is allowed in each face-off. SlamBall is played on a specially designed court that features four trampolines in front of each team’s net. Games are played in four quarters lasting six minutes each with a ten-minute halftime break. The start of each game is marked by a bounce off, in which the ball is bounced into the air. Each team aims to score as many points as they can by placing the ball through the opposition’s net with each team also simultaneously defending their net. Two points are scored for a successful throw through the hoop with three points being scored for a slam dunk or a throw outside of the three point arc. A fifteen second shot clock is utilised in SlamBall. At the end of the game, the team with the most points is declared the winner. If the game is a tie, a series of face-offs are played and the team with the most number of points from these are declared the winner. The game is overseen by two referees and a number of table officials who are there to keep track of the score, fouls, and shot clock.